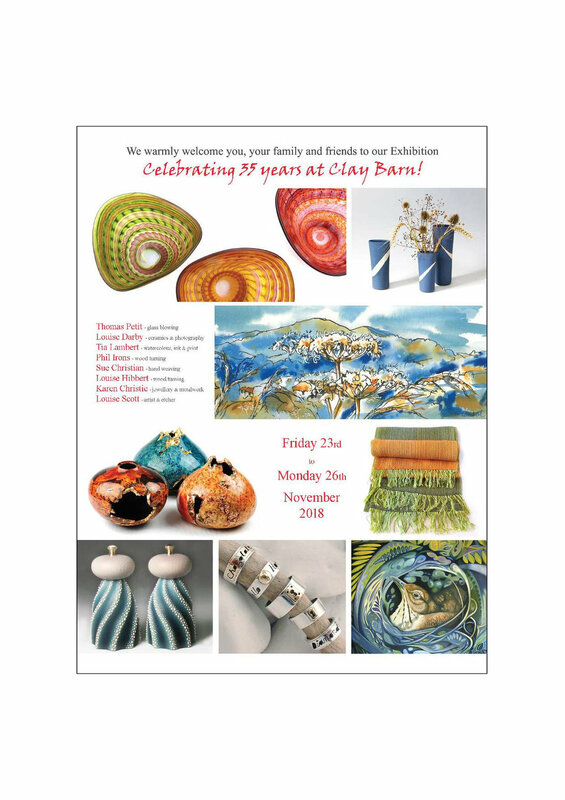 I am delighted to be showing work at The Clay Barn Gallery again. Loiuise Darby holds two exhibitions a year, beautifully presented and a treat to visit. Do come along if you are in the area. You will be welcomed with tea and cakes. Hello … and welcome to October! It’s our annual charity auction, when artists donate their work to raise money for the local children’s hospice - Acorns Hospice in Worcester. It’s about the 12th or 13th year we’ve done it and every year it goes on from strength to strength. This year is no exception … there are some really fabulous small pieces of artwork donated by our very generous artists. If you contact me by email or Messenger, or if you visit the gallery you can get a secret Bidder Number and join in. If you really really want to get one of these beauties you may have to jump in the car this Sunday 7th October and arrive at blue-ginger gallery for the LIVEauction in the gallery which starts at 2pm. It’s always such fun and lots of laughs too. If you really really want one of the items and can’t get here contact us for a Bidder Number and we can organise a proxy bidder for you, who will bid on your behalf up to the amount you stipulate. If you are coming to the auction on Sunday please bring your CHEQUE BOOK with you, and dust off the cobwebs! 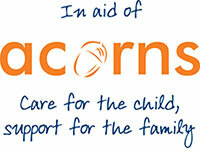 We like to take cash or cheques which can go directly to ACORNS CHILDREN’S HOSPICE. The FaceBook Album is updated daily with new items donated by artists, and we will update it during the auction so you can see how much each item eventually sold for. Do come and see us at Malvern Hills College, Albert Road North, Malvern, WR14 2YH over the Bank Holiday weekend. I hope to be demonstrating charcoal drawing. I exhibited and sold a screen print at this beautiful gallery in May. No, I didn't design this flier.(! )....but I do have an EXHIBITION OF STILL LIFE OIL PAINTINGS for sale, large and colourful Lilies, Daffodils and Sunflowers etc. in the COACH HOUSE THEATRE FOYER, Grange Rd., Malvern, WR14 3HA Tel: 01684 569011 Contact me or the theatre for sales. These are accessible for viewing during events at the Coach House, as of Monday 11th September 2017. Every year, artists donate as small piece of artwork and photos of the donated work appear on the Blue Ginger Gallery facebook page or can be viewed at the gallery and during H'Art Week (9-17 September). Bidding (in the gallery and on facebook) starts from 20 August. Final live auction in Blue Ginger Gallery on Sunday September 24 starting at 2pm. LOOK OUT FOR MYSMALL BLACK AND WHITE MALVERN LANDSCAPE! This new exhibition opens at their Worcester gallery in Reindeer Court and online at www.iapetus.co.uk. The exhibition runs from Saturday 26th August until Monday 28th August. Gallery opening times are Monday – Saturday, 9.30am – 5.30pm and Sundays 11.30am – 4pm. 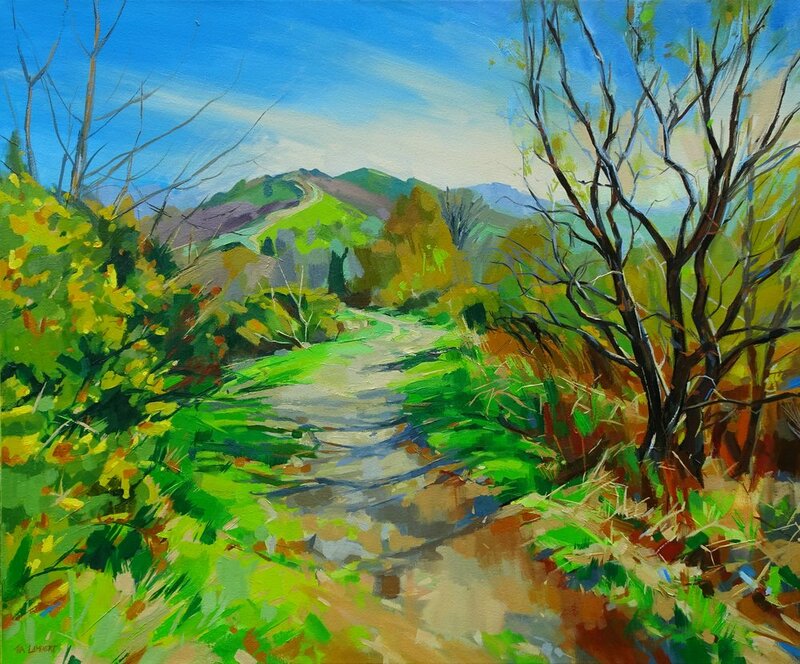 I took part in Worcestershire Open Studios this year at two venues: Malvern Hills College with seven other Malvern Schoolof Art tutors, showing screenprints, watercolours and oil paintings. Also at Iapetus Gallery in their Worcester branch showing screenprints. A very busy and enjoyable three days. My work returns to Iapetus in a new exhibition, Cow Parsley, Paper and Print... a painters journey into printmaking. After many years of working in watercolour, I have branched out into printmaking. 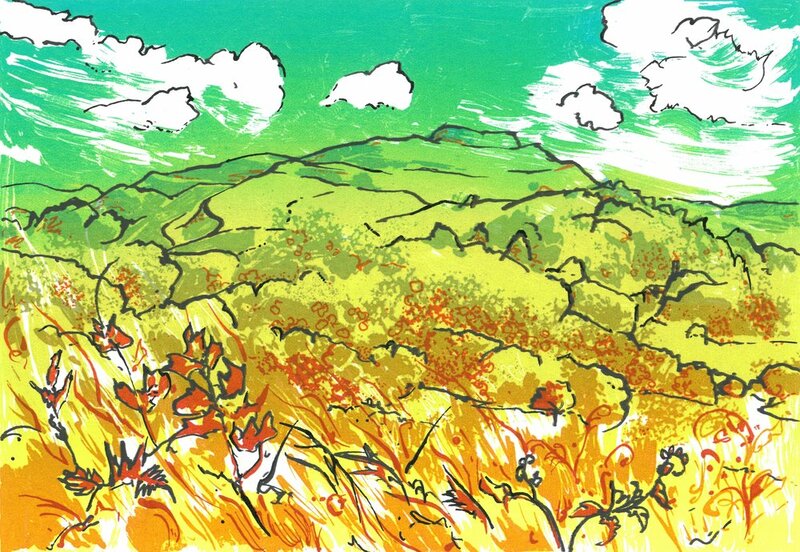 Taking the same subject I have translated my style into bold and colourful prints of the Malvern hills. 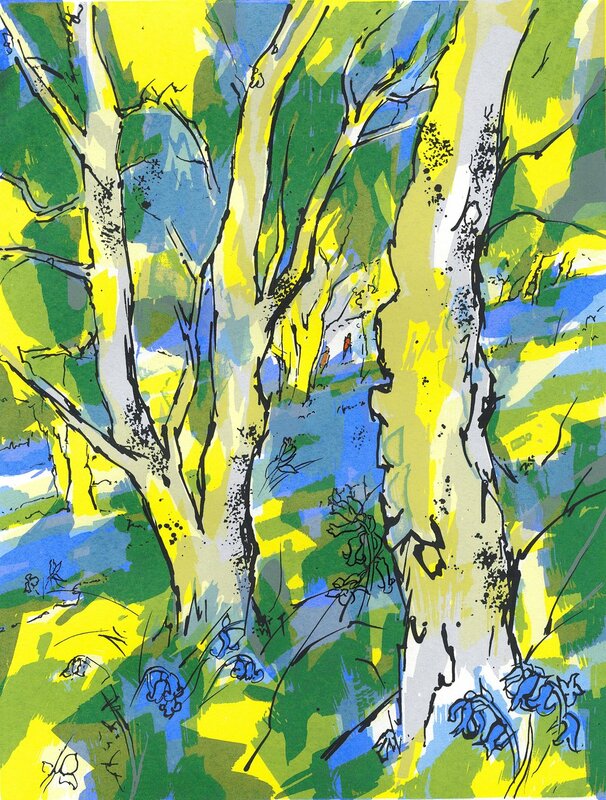 The exhibition will include new limited edition prints of landscapes, as well as a small number of pen and ink drawings. I will also be launching a range of greetings cards featuring many of my latest pieces. I will be at the exhibition on the opening day do come along to learn more about the story behind the screenprints. Cow Parsley, Paper and Print exhibition opens at the Iapetus Great Malvern gallery and online at www.iapetus.co.uk on Saturday 6th May and runs until Sunday 21st May. Gallery opening times are Monday - Saturday, 9.30am until 5.30pm and Sundays, 12 until 4pm. How to make a screenprint, a step by step video. See how Tia creates her beautiful new screenprints for her forthcoming exhibition at iapetus gallery. The exhibition, entitled Cow Parsley, Paper and Print... A painters journey into printmaking, runs from 6th until 21st May 2017 at Iapetus gallery, Great Malvern. You can find more on the Iapetus blog and facebook event page.